However, the dial/knob of the X axis is missing/broken. We are unsure why the axis knobs, notably the Z axis, only turn with great difficulty. We don't feel that is easily solved, certainly not with lubricant; we did apply that. With the X axis not holding the drill in position, I've changed status to broken, because it is not really functional right now. Print or lasercut a knob for X axis, or make a less eye-pleasing thing with the aid of some metal. 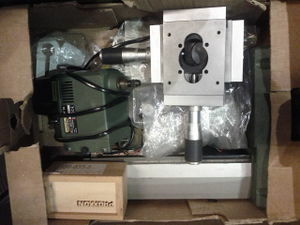 Specify and acquire parts for cnc-i-fy-cation. This page was last edited on 20 October 2013, at 01:54.